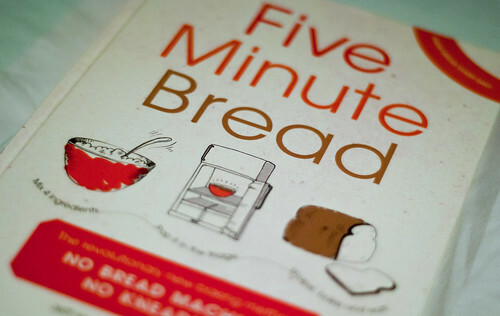 iamafeeder.net » Cookbook Review: Five Minute Bread + A Give-Away! Cookbook Review: Five Minute Bread + A Give-Away! One of my food goals for 2011 was to bake more bread, so you can imagine how thrilled I was when Zoë François and Ebury Publishing asked me if I’d like to review a copy of her US best-selling book Five Minute Bread (in the US known as Artisan Bread in Five Minutes a Day), co-written with Jeff Hertzberg. Newly released in January of this year, the book claims to contain a “revolutionary new baking method: no bread machine, no kneading!” – well, for it to be the no. 1 baking book in the US it certainly seems to have caught onto something good here! 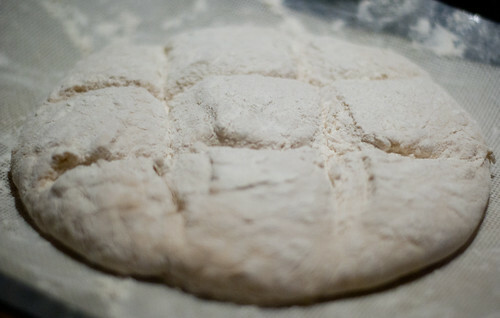 The concept of the book is very simple: fresh homemade bread can be easy, here’s how to do it. How much better than that does it get? It’s straight forward, it’s to the point and it’s delicious. Excited really to be baking bread regularly (and fresh bread gets gobbled up in our house in a nanosecond, unlike store-bought which will literally sit for weeks until mouldy. Ew) I decided that the best way to review four days of baking (the standard recipe yields enough for four 250g loaves and my tupperware box was too small to double it, which meant I’d be missing out on the most sourdough-y bread but still getting a little taste) was to do a day-by-day account of my experience. So, without further ado, here we have it! 6pm: So it’s pretty late to start baking bread, but I figure if I prep it now I can bake it in the morning and give it the night to rest in the fridge. Having read through the cookbook this looks pretty simple, but I would say that it’s not really bread in five minutes, it’s more like bread in six hours and fifteen minutes – sure, maybe it takes five minutes to prepare the dough, but then it has to proof for two hours, sit in the fridge for at least three, have its second rise for forty minutes, then go in the oven for thirty. Anyway, it’s all mixed now and sitting in my tupperware box on the kitchen counter. Hope this works! 8pm: Wow! The dough has risen so much it looks like my box is going to burst! Time to put the lid on properly and stick it in the fridge. 9pm: Um, I just opened the fridge to find a dough monster exploding all over the place. Apparently the lid wasn’t on tightly enough and the dough can still rise in the cold?! Cleaned it up, punched it down, put the lid on properly and put it back in the fridge. 2.30am: Right, that does it, I’ve just had to punch it down again – I don’t care that it’s 2.30am, I’m bloody baking some of this now. 3.25am: The “boule” (read: roadkill) is in the oven. I’m a little worried that during the second rise it not only didn’t rise it, er, spread. The book does say not to worry if it doesn’t rise a lot at this stage as it’ll rise in the oven, but still… I’m blaming the fact that it tried to rise three times in the fridge. I’m trying the steam technique in the book, but I’m a little dubious as to whether or not this is actually going to work. I blame my apparently disastrous bread-making skills. 9pm: Finished baking the second “boule” – still had the same problems with it spreading when I let it rest for 40 mins, despite using a slightly different cloaking method. I decided to cloak it again just before baking to see if it made a difference – it did! It’s much taller and more compact than yesterday’s bread. I also decided to turn it upside down for an extra ten minutes to let the bottom get a slightly better crust on it. When I took the finished thing out of the oven it was definitely crackling and “singing”, unlike yesterday. I think I might be getting the hang of this… tomorrow I’ll try only letting it sit for less time after cloaking. 7.30pm: Just finished baking my last loaf of bread after yesterday’s fail to do so – I was so busy all day that I just came home and crashed out. But it appears to have been to my advantage, as the dough spending one more day in the fridge has taken on a very pleasant sharper almost-sourdough-like quality. I shaped today’s loaf into a pain d’epi – a wheat sheaf shape (or at least my slightly doughier version of it). We ate it hot with leftover pâté – delicious. 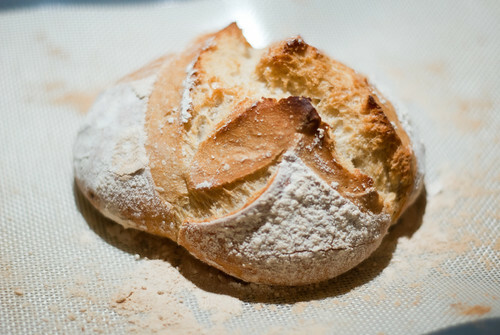 Despite the difficulties at the beginning with the dough’s never-ending rise in the fridge and my complete inability to shape a boule, this is a really great way to make bread. It may not have taken five minutes literally, but after I’d gotten into the swing of things turning out a loaf of delicious bread was as easy as one-two-three – quite literally: shape the boule, rest the boule, bake the boule. I can see why this revolutionary bread baking method has been such a hit in the States. I did begin to resort to other boule shaping methods, which though explained well in the book, didn’t help me, a novice boule-shaper. I found it particularly helpful to watch Peter Reinhart’s YouTube videos on boule-shaping – his technique seemed to work the best for me. It never, however, took me 20-40 seconds. Despite this, the book is really pretty great. It is chock-full of recipes – both savoury and sweet – for the more experienced bread baker to attempt, all using the same easy, no-fuss attitude; helpful hints grace the pages where one may be stumbling in the dark; and it’s all written with a really rather charming, matter-of-fact voice. 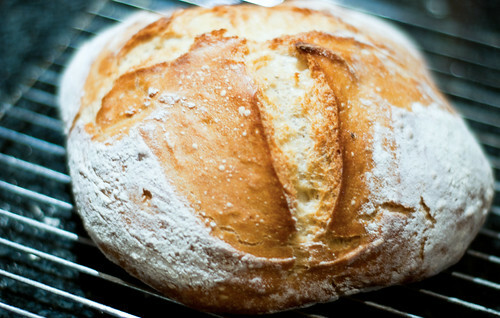 I would recommend it, particularly if regular bread-baking is a habit that you’d like to keep! 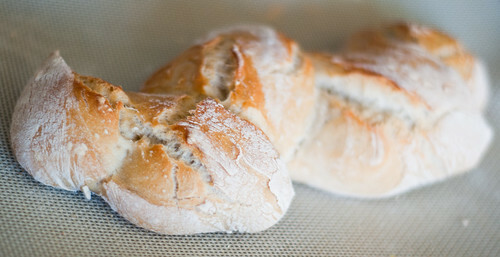 I’ll certainly be baking more bread now that I know it can be so very simple. Even cleaning up wasn’t a hassle because there’s not masses of flour all over the kitchen and you’re only baking things on one pan – the box just goes back into the fridge! Even better. What was your most disastrous baking failure? Tell me your story, no holds barred! The answer that most tickles my fancy will win the book! Because this give-away is UK only and I don’t like to leave out my international readers in give-aways, I’m going to pick two winners, one from the UK & one from anywhere else in the world, and I will personally give away an Amazon Gift Card, for the equal value of Five Minute Bread, to the answer that most tickles my fancy! Am I generous or what? The give-away will finish at the end of the month, midnight (GMT) on the 30th April, 2011 which’ll give you plenty of time to send me your best story! What are you waiting for? Get submitting! That’s all for now then, folks, but stay tuned for more very soon. Until then, peace and love. Please note, I have received no monetary compensation for reviewing the book, but Ebury Publishing provided me with a copy to review and an extra copy to give away. All opinions expressed are my own. Long before I owned my own blowtorch, I decided to make s’mores cupcakes. I started way too late in he evening and made all three layers from scratch – graham cracker crust, chocolate cake and homemade marshmallow. I was unbelievably exhausted after making the marshmallow, but finished strong to get them assembled. I wanted the marshmallow toasted so I popped the cupcakes under the broiler. This is when I discovered that homemade marshmallow does not ‘toast’ it melts and it drips and it falls to the bottom of the oven and catches fire. The result? Flaming cupcakes and the realization that there is a very fine line between toasted and flaming marshmallows. A line that I was sure to cross again later in my baking career! Oh my goodness, Jackie!!! What a story! But look how wonderful this came out! Looks lovely! Epic! My worst disasters in the kitchen always involve baking. Bread. Sigh. I need to channel my inner Jackie next time ;-) Glad you connected with Zoë! You’re so awesome for opening it to non-UK residents like me!! Woo hoo! Okay. Because I am so awesome and smart, I haven’t had much baking failures. But I remember one time when I was baking cornbread. The recipe requires me to heat up some oil in a pan in a 450 degree oven first before pouring in the batter. This is a cornbread that I made like almost every other day. It shouldn’t have gone wrong. But it did. I have no idea to this day what happened. I took the pan of hot, sputtering oil out of the oven, and was just about to place it on the table (to pour in the cornbread batter) when the pan just EXPLODED. It sounded like a gunshot, and I was HOLDING the pan when it just shattered, splattering hot boiling oil and glass shards all across the kitchen. Thank God, I wasn’t even hurt at all. But it was a whole greasy mess in the kitchen and I spent more than an hour scrubbing the floors and such. Some glass shards slipped into the garbage disposal and we had to fix it. I haven’t made the cornbread in some time. I think I’ve been scarred for life. Nah, I’m lying. I was so happy that my cornbread batter was still okay. I fished out the last glass shard in the batter bowl, and after cleaning up, baked it in another pan. I also enjoyed that cornbread. Mmm…. A great challenge for 2011. I marvel at the people who tackle baking bread with ease and it always comes out looking so wonderful and disaster-free. My personal disaster was making pizza dough recently. I had my well all set up and I started to pour the liquid in and before I realized it, my well wasn’t big/deep/large enough and the liquid combined with the flour and yeast ran like a tidal wave down the counter down the cabinets and onto the floor. I did my best to clean it up, but the smell of yeast lingered for a couple of days. 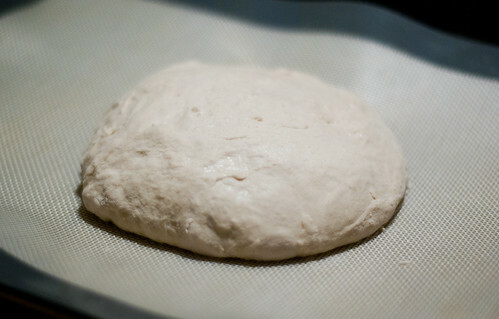 Not to be defeated, I went back to the store, bought more yeast, put my well in a huge bowl and made my pizza dough! Not quite how it was drawn up in the recipe, but I finished it and learned a valuable lesson. When in doubt, make the well big! 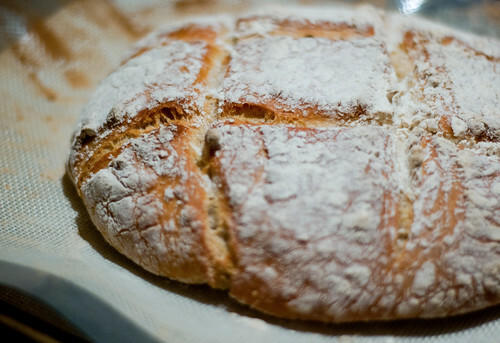 This post is very difficult to read for someone who has given up bread for Lent! 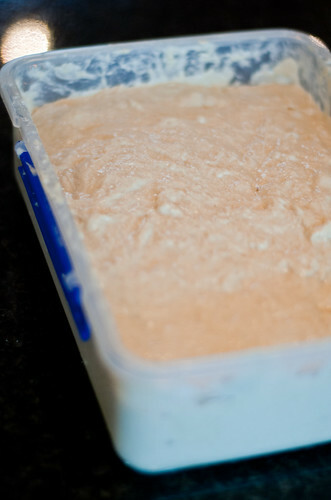 *drool* I am making bread the moment Easter rolls around… I mean it, at 12.01 I wil be there, breading it up. I have, er, rather a lot of baking failures to choose from, mostly due to a slightly experimental and haphazard approach to baking. I do thankfully have a larger number of baking successes but my most recent baking catastrophe was really quite stupid and embarrassing. I was asked to bring a cheesecake to a party, because I am well-known amongst my friends for being good with cheesecake (uh, usually). I decided at the last minute though to adapt my usual NY-style cheesecake recipe to a honeycomb baked cheesecake, I did this by just adding honeycomb to the recipe. Disaster number 1: the honeycomb, of course, melted, leaving the mixture considerably more liquid than usual. After the standard 2 hours baking time it had not set. Not even a little bit. Seriously… not at all, liquid cheesecake. It was, by this time, approximately midnight. I set my timer for another hour and returned to the TV. An hour later… better, encouraging signs of setting around the edges, but still not cooked. Now, I needed to be up very early the next day for a meeting, so I set the timer and went to bed, intending to get up and remove the cheesecake when the timer went. Surprisingly, this isn’t the disaster, this worked, the timer went another hour later and I got up to turn the oven off and let the cheesecake cool in the oven overnight, as usual. Now for the truly disastrous part: I was half asleep. My oven only has one knob, you turn it fully one way to turn it off, you turn it fully the other way to turn on… The Grill. Yes, ladies and gents, I went back to bed, and left my cheesecake GRILLING in the oven. I can tell you now, cheesecakes do not grill. Particularly ones with very high levels of honeycomb that has all risen to the top. I woke up another hour later to the smell of burning sugar and ran desperately to the rescue of my destroyed cheesecake. Long story short, the next morning I had to cut off the top half of the cheesecake and cunningly pretend it was supposed to be quite thin. And a bit messy. And tasting slightly of caramel. The moral of this story… don’t get experimental at 10pm when you have an early meeting. Oh, and don’t grill cheesecake. i once forgot to put 2 tablespoons of water into my scones at cookery class at school, thinking, ‘oh, it’s too wet already’. rock hard. they were awful. not baking really, but i got some of that ready-made filo pastry once and tried to make some very simple veggie parcels which involved putting a blob of mixture in the middle and then bunching the filo up into a ball so they looked like little bombs. trouble was, THAT mixture was too wet and the filo just kept going soggy when i put it in. didn’t think to simply lay the filo straight onto the baking tray and then wrap. oh no. i did it on the chopping board and tried to pick them up to put them onto the tray. splat! i ended up throwing the filo against the window and screaming very loudly. and that was me cooking something extremely simple. doh! My most disastrous baking happens early on in my kitchen ventures. Don’t ever substitute the size of the baking pan if you are a beginner. You could only imagine when my fluffy cake batter oozes over the cake pan and dripped all over the bottom of the oven. Needlessly to say, the smell of burnt batter/sugar was bad and the smoke effect was even worst. The only good thing came out of the disaster was, it made me even more determined to be a better baker. The winners of the give-away have now been chosen! Thanks all!